The politics of reputation can pose thorny challenges. As Warren Buffett famously noted, “it takes 20 years to build a reputation, and five minutes to ruin it.” Especially if you’re a small, highly successful jurisdiction that finds itself in the bulls-eye of global grandstanding. Bermuda’s long-established status as a world-class international financial centre is something the BDA guards carefully. Competing domiciles lose little sleep attempting to undermine and tarnish the island’s top status. Threats to our global character are constant—witness the perennial pot-shots, black-lists, “tax-haven” rhetoric, NGO fallacies. Amid this hostile climate, our reputational stewardship demands an all-hands-on-deck approach. Our focus at BDA is to foster the kind of collaborative governance that brings government, community and private sectors together as active gatekeepers of our blue-chip global status. In the wake of a general election, it is especially important to set the tone of transparency and collaboration to assure global investors, both domestically and overseas, that Bermuda is, indeed, open for business. “Local” essentially goes global in this context. Our healthy, 400-year-old democracy has always demonstrated robust politics, but reputation can be fragile in times of transition. Our collective words and actions must follow suit. I’m informed those initial meetings were productive, as was mine with the Minister of Economic Development, paving the way for a fruitful and positive partnership. The BDA’s unique role as a private-public unit allows us to act as an effective liaison between government, regulator and industry to achieve collaborative communications, here and abroad. We’re committed to continuing this effort in tandem with all our key stakeholders. Notable was a second press conference the Premier held to announce the government’s commitment to Bermuda’s economic future. In particular, the Premier said, the government would make it a national priority to prepare Bermuda for next year’s anti-money laundering [AML] and anti-terrorism financing [ATF] assessment by the Caribbean Financial Action Task Force [CATF]. This is a critical examination that should validate our internationally respected regulatory reputation. The government has pledged to work closely with Bermuda’s National Anti-Money Laundering Committee [NAMLC] to expedite outstanding issues, including necessary legislation—to be tabled at September’s re-opening of Parliament, two months earlier than usual. As the Premier pointed out, the island’s economic stability and the health of our international business platform depends heavily on the positive outcome of compliance tests such as these. There is no doubt global eyes are upon us; external challenges spawned by the ever-evolving regulatory landscape are the new norm. Over the next 18 months, the outcome of several such examinations will be significant: in addition to the CATF assessment, examples include the OECD Review, implementation requirements of the OECD Common Reporting Standard and Country-by-Country reporting, and a questionnaire sent to our Ministry of Finance earlier this summer by the European Union Code of Conduct Group. Each initiative heavily tests our budget, human resources, infrastructure, and, perhaps most tellingly, our collective stamina. Yet we have something that many of our rivals do not: our pride, national resolve and proven ability to work together for the sake of all Bermuda residents. 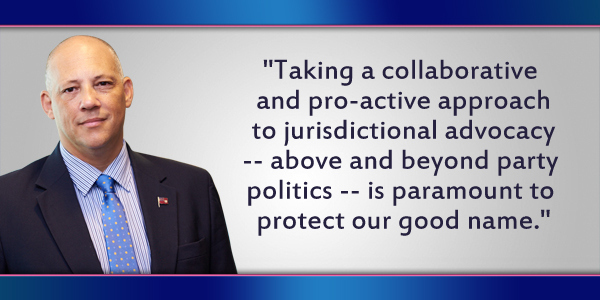 Taking a collaborative and pro-active approach to jurisdictional advocacy — above and beyond party politics — is paramount to protect our good name. Future generations of Bermudians will thank us for it. Mr. Webber what an objective an optimistic article. This government has repeatedly asked to be held accountable and has committed to transparency. A listening ear, objective input and wise counsel will ensure Bermuda’s economic future. Thank you Mr. Webber. Really hope you aren’t replaced shortly by PLP for a currently unemployed PLP supporter cuz we all know DREB wants people that look like you pushed out ASAP..
Whatever. You and your IB friends kept your criticism of the OBA inside the boardroom and never let it spill out. Not a word publicly about progressive payroll tax which we know you opposed. Meanwhile, before the ink was dry on the counted ballots, one of your number couldn’t wait to start criticizing a government that hadn’t even been sworn in. When you treat the PLP with the same respect you treated the OBA then you’ll get my attention. The industry has far more to do to warrant an end to our suspicion than fake congratulatory press releases and OpEds like this that run counter to how you all behaved since 1998. Breathe: You have no idea about Mr Webber or the people who work at the BDA. These are the real deal. They have been non/bi partisan since the beginning. Originally formed under PLP, continued under OBA and ready to carry on again under this PLP. IB provudes Bermudians with thousands of long term jobs and careers. If you don’t want to participate don’t. Just try not to eff it up for the rest of us. When the PLP treats all people with respect…not just those ‘who look like them’, then the plp, and its followers will have a leg to stand on. For now, the plp is anti equal rights, xenophobic and homophobic….nothing at all to be proud of.